The Pokemon Trading Card Game celebrated its 20th anniversary in North America this year and it is still going strong to this day! My daughter being an avid Pokemon fan happened to receive a few boosters from the latest expansion for her birthday and just adored them. Being a long time collector of the cards myself I thought back to when I also got my first booster packs. The game has changed little from the original days but it is still a joy to rip open those boosters to see what treasures awaited inside! As I watch my daughter ooo and ahh over various cards artwork, I wanted to go back in time and revisit some of my personal favorite card arts the original 3 releases of 1999. All of the cards featured below are from the Base Set, Jungle and Fossil expansions. Rounding out the bottom of my list is Mr. Fuji, the only trainer card from the 1999 card releases to make the cut. Mr. Fuji is an avid fan of Pokemon within the games lore. He takes care of abandoned Pokemon and even went to tell off Team Rocket when they killed poor Cubone’s mother. There is a mysterious side to this Pokemon Fanatic however as he was once a doctor who lived on Cinnabar Island in a now destroyed mansion… Mr. Fuji’s card art from illustrator Ken Sugimori perfectly captures the kind nature of Mr. Fuji. You can tell exactly how much he loves Pokemon and how much the Pokemon in his care love him back. Mr Fuji appears in the Fossil Expansion. Pikachu really needs little introduction. Becoming the series poster child nearly instantly from the outset of the Anime Pikachu has undergone a few changes over the years. Back in the beginning Pikachu was a bit on the thick side. The earliest seasons of the Anime also used this beefier design for the electric mouse but somewhere along the way Pikachu saw some massive weight loss. The card from illustrator Ken Sugimori takes us back to these simpler times when a series mascot could be thick and proud of it! 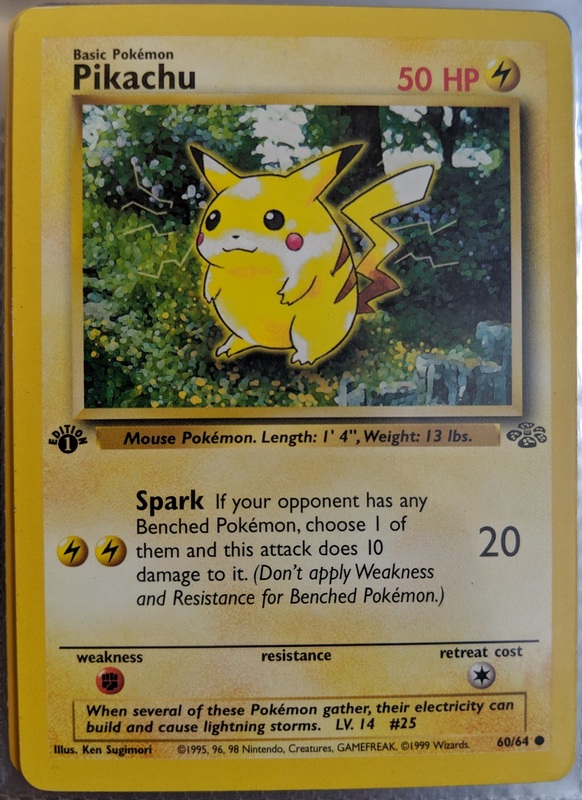 Pikachu is from the Jungle Expansion. Arcanine is depicted as a Majestic Pokemon that is also fiercely loyal to its trainers. Arcanine is also one of the fastest Pokemon know to the series with lore station it can run over 6,200 miles in a 24 hour time frame. Arcanine first rose to fame from being one of Gary Oak’s Pokemon that had a fateful encounter against Giovanni and Mewtwo. Arcanine would be seen used by Gary in later episodes and numerous other appearances since. The art illustrated by Ken Sugimori perfectly captures the Regal look of Arcanine and the semi realistic looking background is a nice compliment. Arcanine is from the Base Set. 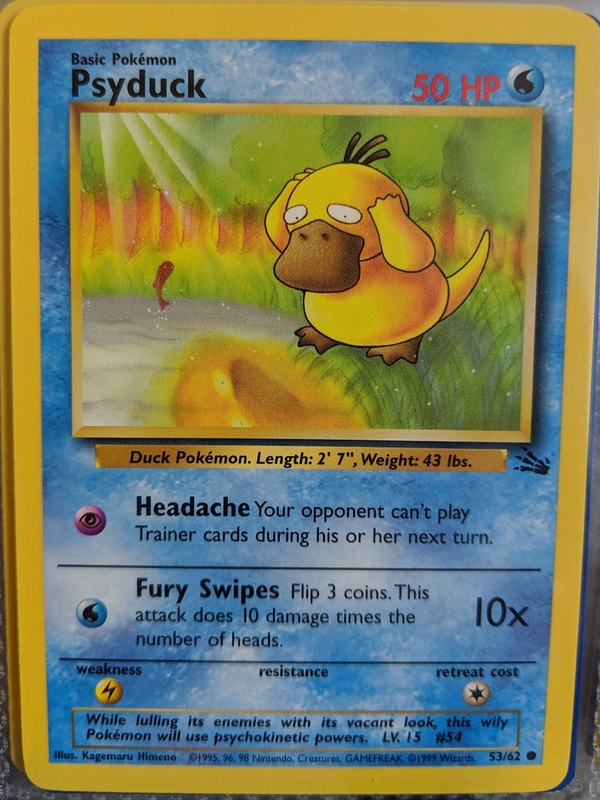 Psyduck, the poor duck who will never catch a break from its onslaught of headaches. Psyduck and by extension its evolution Golduck are a sort of favorite among some Pokemon fans. Psyducks most prominent role has always been from the first seasons of the Pokemon anime as Misty’s incompetent doof of a Pokemon. despite its goofy portrayal Psyduck always came through in a pinch and saved our heroes on a few occasions. In the more recent season of the Pokemon Sun and Moon anime we got to see a more deserving portrayal of Misty’s Psyduck as it takes on 2 other Pokemon at once in a mock gym battle. The card from illustrator Kagemaru Himeno really captures this early portrayal of Psyduck. Looking downright depressed and staring into the water, Psyduck looks like it wonders if the headache will ever go away. Psyduck is from the Fossil Expansion. Gastly is the first form of everyones favorite ghost Gengar! Gastly has had a few different portrayals throughout the years from being a creature to be feared to an entity just looking to have a good time. Gastly’s most notable role for me will always be from the Pokemon tower in Pokemon Red and Blue where the Pokemon is seemingly implied to have possessed numerous maidens to do their bidding. Even as you progress up the tower more haunted maidens appear to hinder your progress until one maiden who has been spared possession provides a zone of healing and protection. Gastly’s more prankster nature is what seems to have endured over the years and the card from illustrator Mitsuhiro Arita catches this wonderfully. Gastly look like it is deep in concentration planning its next big prank and the mere thought brings a subtle smirk to the Pokemon. Gastly is from the Fossil Expansion. Aerodactyl is an ancient Pokemon long thought to be extinct. Throughout the games players can find Aerodactyl fossils and scientists within the game are more than happy to resurrect the ferocious creature for our young protagonists. In the Anime Aerodactyl makes several appearances over the years but none as memorable to me as that first encounter where it abducts Ash. Being angry about losing in battle to the ancient Pokemon Ash’s hot headed Charmeleon evolves into the even hotter headed Charizard. With the help of Jigglypuff, Aerodactyl is returned to the cave it came from safely. The card from illustrator Kagemaru Himeno captures the ferocious attitude of Aerodactyl. The background also sports a ancient looking tropical design and it looks nice with the holographic foiling. 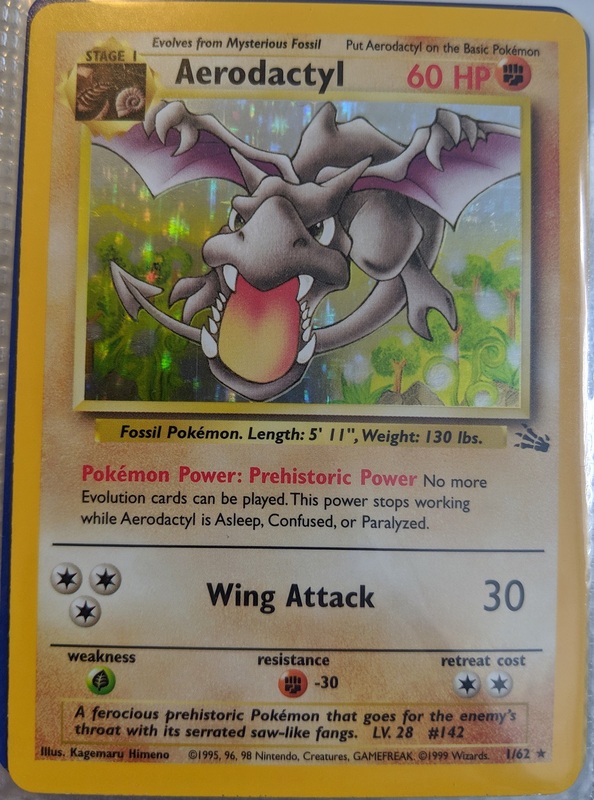 Aerodactyl is from the Fossil Expansion. Charizard will forever be one of my favorite Pokemon since it was my first starter in Pokemon Blue so many years ago! Charizard has been portrayed as one of the series stronger Pokemon throughout the franchises history. Charizard has seen many portrayals throughout the years from Ash’s hot headed disobedient Pokemon, to nearly dying from an Ice Beam attack the very next season. Ash’s Charizard would leave Ash to pursue its own growth during the Jhoto arc but that wasn’t the last we saw of the giant Lizards as it came to Ash’s aide during the Silver League Conference. The Charizard card art from illustrator Mitsuhiro Arita really shows off the battle spirit that seems to posses many Charizards. Delivering a raging Fire Blast any Pokemon caught in its path is sure to have a bad time. Charizard is from the Base Set. The mean tempered terror from the deep Gyrados is the fear of many a seafaring residents of the Pokemon world. Evolving from the practically worthless Magikarp, I can honestly see why Gyrados is so angry all the time. After being pushed around since hatching until level 20 I think I’d have some anger issues as well! In the Anime this cycle of abuse is perfectly on display when James of Team Rocket gets swindled into buying a Magikarp as part of a get rich quick scheme. After being stranded in the ocean after the sinking of the SS. Anne, James realizes how worthless the flopping fish is and kicks it into the sea. After the kick Magikarp evolves into Gyrados and delivers its own swift justice to its former owner. Or maybe Gyrados is still mad that it isn’t a dragon type Pokemon after all these years and can’t stand it still has that 4x weakness to electric moves. Either way the rage of Gyrados comes across nicely in the card illustrated by Mitsuhiro Arita. Gyrados can be seen using an attack and the waters behind it have begun to whirlpool giving this card a ton of atmosphere. Gyrados is from the Base Set. I think I can safely say that any Pokemon trainer who got their start with Pokemon Red and Blue have used a Butterfree at some point during their games. As someone who started out with a Charmander, it was Butterfree and its confusion attack that would lead me to my first gym victory over Brock. Butterfree is the final evolution of the Caterpie line and working through its weaker stages fully rewards you with a capable Pokemon for the beginnings of your journey. Butterfree also had a prominent role early on in the Pokemon anime as being one of Ash’s Pokemon. The Caterpie that would eventually evolve into Butterfree was even the first Pokemon caught by Pallet’s newest trainer. Butterfree would leave Ash’s side fairly early on in the show as it pursued its love interest in the Pink Butterfree in a pretty emotional goodbye episode. The card from illustrator Kagemaru Himeno makes me imagine that it is Ash’s Butterfree living out its days in a beautiful field gathering food for its love the pink Butterfree. Butterfree is from the Jungle Expansion. Charmander is one of the three starter Pokemon any new trainer can pick when beginning their Pokemon adventure! Charmander was my very first Pokemon in Pokemon Blue and going on that journey was truly an experience that makes it one of my favorite gaming memories! Oddly enough, I didn’t get a Charmander card until after the release of the Fossil Expansion in late 1999. I always wondered what it would be like to keep a Charmander as a pet. If Pokemon were somehow real it would be a Charmander I would want most. Though the fact that Charmander has a never ceasing fireball on its tail would hardly make it an ideal house pet as I have come to realize over the years. Anytime it put its tail down you run the risk of losing your house! Well I mean you could do a stone flooring the way it wouldn’t ever burn… OK, I am think to hard about this again. Anyways, the card from illustrator Mitsuhiro Arita perfectly captures the perils of what could happen with an unattentive Charmander. The flame on Charmander’s tail has ignited some grasss and Charmander looks troubled by the realization. Other fires can also be seen in the background of the card leading to the assumption that this Charmander has had a few other accidents in the fields that day. Charmander is from the Base Set. 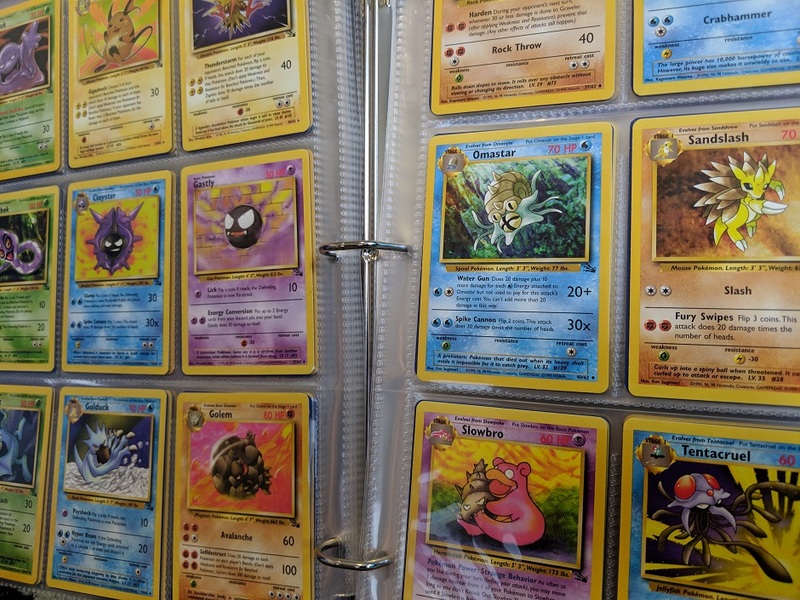 There are a total of 228 cards that make up the Pokemon Trading Card games first 3 sets. These are my 10 favorites but there are so many more that look awesome! What cards are your favorite and what did you think of my list? If you have any great Pokemon TCG stories Share them below in the comments! List: The 5 Coolest Official N64 Console Variations!